Mackie Mix Compact Mixers deliver the quality you expect from the world leader in compact mixer design. The professional and affordable Mix Series mixers feature high quality components, a rugged metal chassis and features designed for a variety of applications. With Mackie preamps and proven high-headroom, low-noise design, Mix delivers great sound from any source. Mackie has more than 25 years experience designing rock solid compact mixers like VLZ and ProFX. 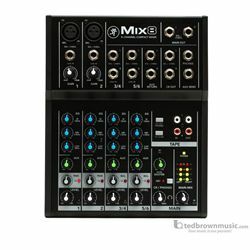 Mix Series Compact Mixers deliver on the proven performance, sound quality and rugged reliability Mackie mixers are known for at the most accessible price ever. Don't settle because of budget and get the performance you deserve with Mackie Mix Series.